Our beautifully recreated cupboard twist and turn latches feature solid brass or cast iron construction and provide a classic, practical utility for your cupboard or cabinet door. 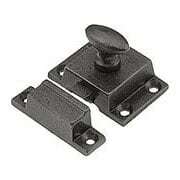 Includes all required mounting hardware for easy installation. Combining simple beauty and practical utility, this early 20th century turn latch is an American hardware classic. At once a latch and a pull, it's a handy addition to cabinets throughout your house. 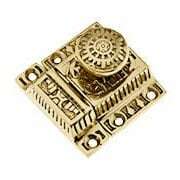 Finely cast from solid brass with 6 great finishes. Combining simple beauty and practical utility, this early 20th-century Small Cupboard Latch is an American hardware classic. 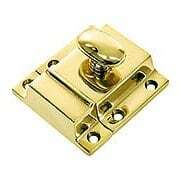 At once a latch and a pull, it is a handy addition to cabinets throughout your house. Finely cast from solid brass, it features our hand-applied antique finish that continues to age gracefully over time, developing highlights with use. Combining simple beauty and practical utility, this early 20th century turn latch is an American hardware classic. At once a latch and a pull, it's a handy addition to cabinets throughout your house. 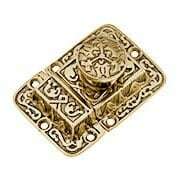 Finely cast from solid brass with 4 great finishes. Combining simple beauty and practical utility, this early 20th-century Large Cupboard Latch is an American hardware classic. 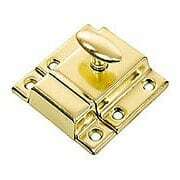 At once a latch and a pull, it is a handy addition to cabinets throughout your house. Finely cast from solid brass, it features our hand-applied antique finish that continues to age gracefully over time, developing highlights with use. Combining simple beauty and practical utility, our Plain Cabinet Latch is a turn-of-the-century American hardware classic. At once a catch and a pull, it is a handy addition to cabinets throughout your house. Finely cast from solid brass and offered in an array of traditional finishes. The bold and graphic Oriental-Pattern Turn Latch is one of our favorites. Originally designed by Branford Lock Works, circa 1885, this striking latch displays an open fan, a rising sun, and bamboo. 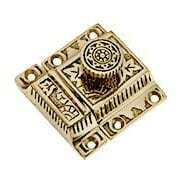 Cast from solid brass and available in two finish options. The bold and graphic Oriental-Pattern Turn Latch is one of our favorites. Originally designed by Branford Lock Works, circa 1885, this striking latch displays an open fan, a rising sun, and bamboo. Finely cast from solid brass and hand-finished with our living antique patina. The bold and graphic Oriental-Pattern Turn Latch is one of our favorites. Originally designed by Branford Lock Works, circa 1885, this striking latch displays an open fan, a rising sun, and bamboo. 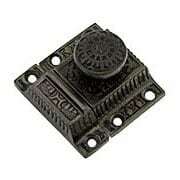 Finely cast from solid iron with an antique iron finish. The bold and graphic Oriental pattern is one of our favorites. Originally designed by Branford Lock Works, circa 1885, this striking latch displays an open fan, a rising sun, and bamboo. Cast from solid bronze with a highlighted antique finish. 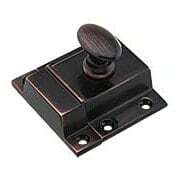 Whether you have a timber cabin or a colonial cottage, this rugged iron latch is a great choice. Practical and durable, it keeps your cabinets tightly closed. Antiqued and lacquered to prevent rust. This Colonial cabinet catch is operated by lifting and pulling the small knob. Designed for use on cabinet doors or interior shutters, it adds a unique and authentic period flavor to any room. Made of forged iron with a smooth black finish. 1 13/16" H x 2 13/16" W.
This Windsor Pattern Cabinet Latch with Round Knob is one of our finest Victorian-era reproductions. Introduced by Reading Hardware around 1885, the whimsical Aesthetic design is just as fresh and lovely today. Cast from solid brass and available in two classic finish options. This Windsor Pattern Cabinet Latch with Round Knob is one of our finest Victorian-era reproductions. Introduced by Reading Hardware around 1885, the whimsical Aesthetic design is just as fresh and lovely today. Cast from solid brass and hand-finished with our living antique patina. 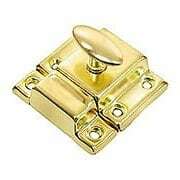 This Windsor-Pattern Cabinet Latch with Round Knob is one of our finest Victorian-era reproductions. Introduced by Reading Hardware around 1885, the whimsical Aesthetic design is just as fresh and lovely today. 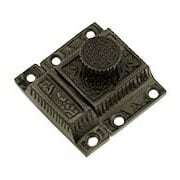 Finely cast from solid iron with an antique-iron finish. The butterfly pattern on our ornate Victorian Butterfly Turn Latch in Antique-By-Hand gives a fanciful look to your cabinets and furniture. Finely cast from solid brass and hand-finished with our living antique patina. The butterfly pattern on our ornate Victorian Butterfly Turn Latch gives a fanciful look to your cabinets and furniture. 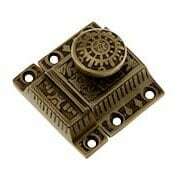 Finely cast from solid iron, it features an antique-iron finish. 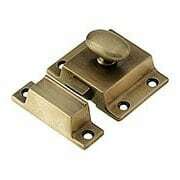 Late 19th, early 20th century style pull with latch for cabinets or furniture. 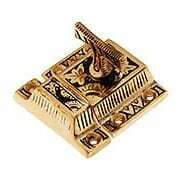 Made of solid cast brass with an unlacquered finish. 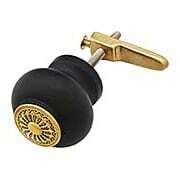 Handle measures 3 3/8" T x 3/4" W x 3/4" P.
Add a new level of distinction to your cabinets and furniture with this Victorian-style cupboard turn with ebonized wood knob. It features a decorative on lay with an intricate, Eastlake design in an unlacquered finish. Turn button catches were traditionally used on early cabinets such as pie-safes and jelly cupboards. This surface-mount turn button can be used for securing table extensions as well as doors and drawers that are flush with the cabinet. 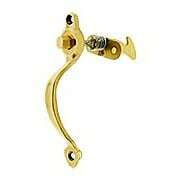 Especially handy on boats it is made of solid brass and comes with an un-lacquered finish. Turn button catches were traditionally used on early cabinets such as pie-safes and jelly cupboards. This surface-mount turn button can be used for securing doors and drawers that are flush with the cabinet. 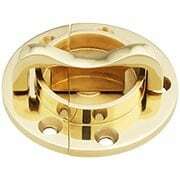 Especially handy on boats it is made of solid brass and comes with an un-lacquered finish. 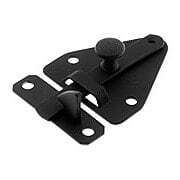 Our Large Stamped-Steel Cabinet Latch is as affordable as it is authentic. Lightweight and slightly distressed, it's a great choice for utilitarian locations or for restorations of modest vintage homes. 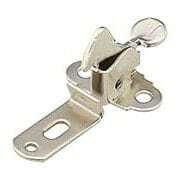 Our Small Stamped-Steel Cabinet Latch is as affordable as it is authentic. Lightweight and slightly distressed, it's a great choice for utilitarian locations or for restorations of modest vintage homes. Traditionally used on early cabinets like pie-safes and jelly cupboards, our Small Turn Button, adds retro style to your furniture. 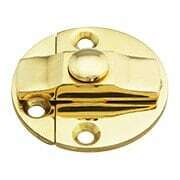 This surface-mount catch can be used for securing doors and drawers that are flush with the cabinet. 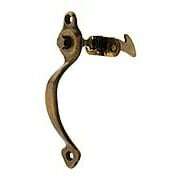 Especially handy on boats, it is made of cast-iron with a rust-resistant, zinc finish. Use as is, or painted. Traditionally used on early cabinets like pie-safes and jelly cupboards, our Medium Turn Button, adds retro style to your furniture. 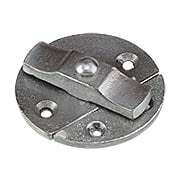 This surface-mount catch can be used for securing doors and drawers that are flush with the cabinet. 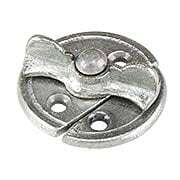 Especially handy on boats, it is made of cast-iron with a rust-resistant, zinc finish. Use as is, or painted. Traditionally used on early cabinets like pie-safes and jelly cupboards, our Large Turn Button, adds retro style to your furniture. 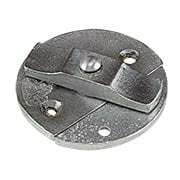 This surface-mount catch can be used for securing doors and drawers that are flush with the cabinet. 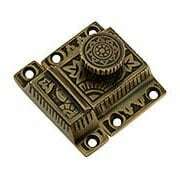 Especially handy on boats, it is made of cast-iron with a rust-resistant, zinc finish. Use as is, or painted.